Looking at the menu, we took longer than usual to order. There were so many great sounding dishes, we had trouble picking just one each. We decided to go with the mozarella di bufala with tomatoes, pesto, figs and arugula and the classic beef tartare on recommendation of the waiter. The mozarella was ah-mazing. Fresh tasting, with the texture firm but also creamy, the dish was delicious. I finished it up in no time. While it was one of the lighter starters, I was in the mood for some greens and something on the healthier side and it worked perfectly with what I wanted. The tartare was mixed in with some cayenne pepper, making it spicier than your typical raw beef dish. I then had the lobster ravioli which came plated with around seven pieces. Biting into each bit of pasta gave you a balanced taste of the truffle oil, the beurre blanc and the lobster itself. Mm! While this may not look like enough to fill you for the evening, it is surprisingly heavier than you would think based on the picture. 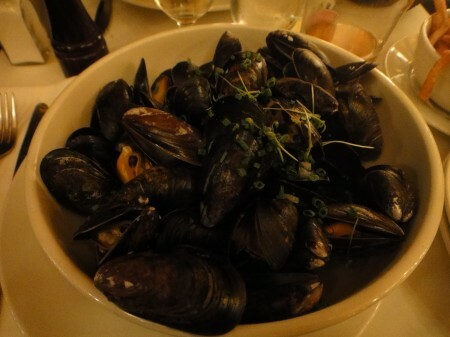 The mussels were offered in either a mariniere or a pastis broth – we went with the former. Coming along with some house fries with mayonnaise dip, this too ended up being hearty in the end. To finish the evening off on a sweet note, we ordered the butterscotch mi-cuit with Maldon salt, butterscotch ice cream and an almond wafer as well as a chocolate mousse, coffee ice cream with cocoa and coffee sauce. The mi-cuit was the best one I have ever had. I cannot stress how amazing the dessert was. You need to go here, if only for this particular dessert. Plunging my spoon into the cake, the butterscotch quickly ran out the top, oozing delectably out onto the sides. Taking that first bite was heaven – getting a mix of the cake, topped with the butterscotch and Maldon salt – oh man. Cannot describe how good that tasted. I really can’t say more than that. You’ll have to go here yourself to check it out. The chocolate mousse was also very nice – best for intense coffee and chocolate lovers though as the taste of both is quite strong. All in all, we had a lovely evening here. Now go and order the mi-cuit! Tags: Almond Wafer, Arugula, Beef Tartare, Butterscotch, Butterscotch Ice Cream, Chocolate, Chocolate Mousse, Classic, Classy, Coffee, Dinner, Fancy, Figs, Holder, Ice Cream, Lobster Ravioli, Maldon Salt, Mariniere Broth, Montreal, Mousse, Mozzarella di Bufala, Mussels, Pesto, Ravioli, Vieux-Montreal.